I just love devoxx. Perfect place without working yet breathing in and out software.Was again excellent this year, full of tech and fun. Wristbands.Loved them.Devoxx organisers just built this great mechanism to facilitate lunch and other stuff collecting and voting for sessions via these wristbands.Integrated NFC module,waterproof.All software built in-house. It is being used at least for 3 years.You don’t ever need to take it off,so no ‘check where the badge is’..
Devoxx Hunt.Excellent gamification. They ordered hundreds of again NFC module devices (from China) and distributed the to all over the city of Antwerp and the venue.Via you mobile app,you could collect those beacons,as you get physically close to them, unlock achievements and win free tickets to next devoxx.Software was built on Java 9 according to what one of the devs said.Great work. Appreciate this innovative spirit of Devoxx crew. Voxxed.com :Server-side replacement,it looks like.A web site where you can quickly get updated about what is going on in Java world. Docker was one of the most popular technologies shined on us.Other starts of the devoxx were Openshift,Angular.js,Polymer, Websockets,Raspberry Pi(Of course),Java 8 Lambdas and JavaEE Microservices. -So many simultaneous conferences,hard to choose..It is handy that devoxxians will have 1 year free Parleys subscription and will be able to watch other sessions on the web. -There were lots of non-techie sessions this year. Session about creativity by Denise Jacobs was remarkable. There was also a whole stream about startups. A guy told about his really painful experience as a contract developer where he did not get any payment. Company he worked for owed him around 20 grand euros.I don’t remember the exact amount but it was something in this range.So he was really determined to get it through following legal procedures.After 1.5 year,he ended up having already spent another 20K and still could not even get in front of a judge.For that he needed some more time and more money.And the judge is as you can imagine a 60+ with no understanding of any technical stuff whatsoever.So his clear message was ‘if you can not get your many,just write it off! Forget about it and move on with your life.’ Pretty upsetting story. We are adding full text searching functionality to our application.This tutorial assumes that you already completed part 1.Please refer to here for part 1. Unfortunately,Couchbase does not have full text search feature as of version 2.2.0. So,it is advised to integrate Couchbase with elasticsearch to provide this. Elastic search is a search analysis tool and a key value store which is getting more and more popular. 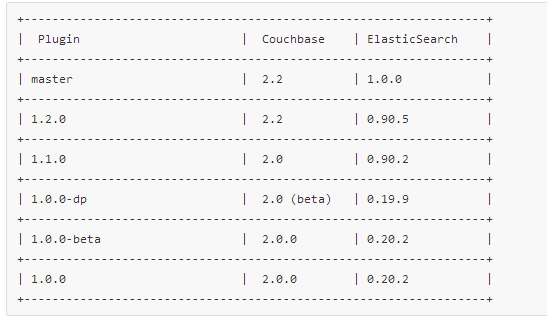 Install Elasticsearch version 0.90.5 since this is the one compatible with Couchbase 2.2.0.Installation available here. Verify that you can see administration console of elasticsearch upon starting on http://localhost:9200/_plugin/head/ . Navigate to the Couchbase Server admin interface. Enter the Username and Password corresponding to your “couchbase.username” and “couchbase.password” settings in ElasticSearch. Refer to bullet no 2 for this. Click advanced settings and set XDCR Protocol to version 1. 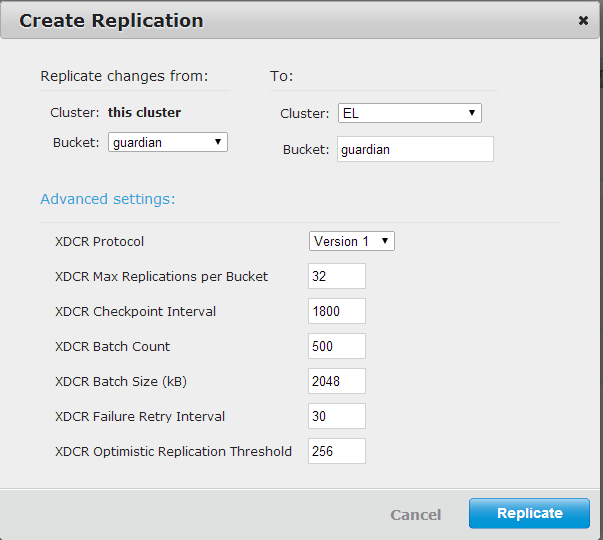 Verify on elasticsearch admin console that replication took place. Now that you completed the installation and configuration,it is time to run the code and try it out. Go to github and download the code available at https://github.com/selmantayyar/guardian-news-content/tree/version2 . This is the same github repository as the part one but on a different branch.To avoid installing couchnode again,just override your current local code copy with this.If this is the first time you are running this code,follow the instructions on readme file.Otherwise just type node app.js and enjoy it. But how does the searching work?Application does a REST call to elastic search server sending the keyword.A very simple post request,which makes elastic search really easy to use.By the way,a very nice introduction to elasticsearch is here. 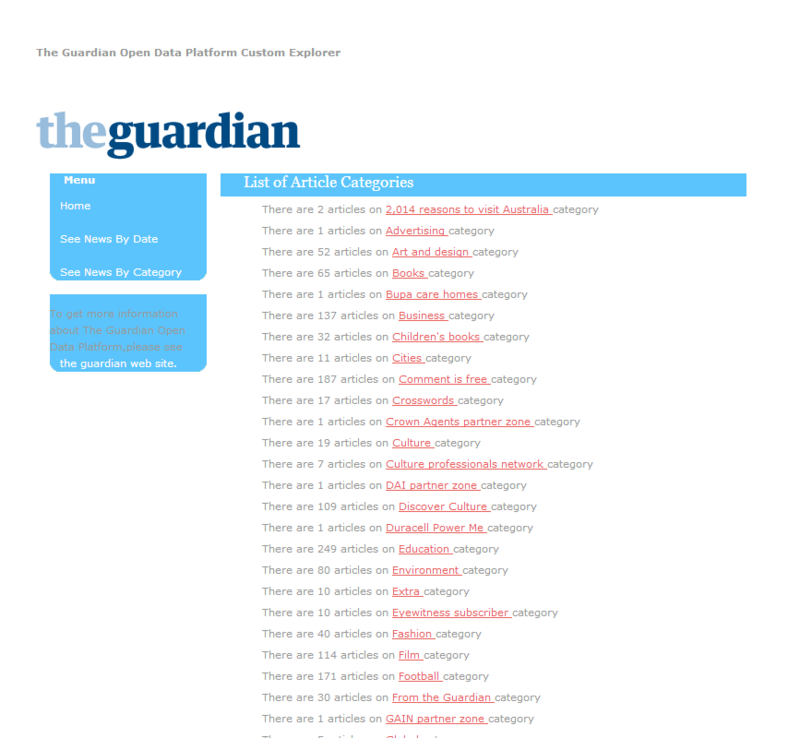 To sum up, noticing that Couchbase(as of version 2.2.0) does not have any full text search feature is a bit disappointing.You need to install elasticsearch,replicate the data to it and handle all the data transfer issues,indexing issues(updating data sometimes could require indexes and mappings to be updated ..etc) and other potential issues.This is an additional operational burden. Couchbase is really good for storing data and retrieving it by key or by some other indexes.It is also easier to manage replicas.However, i still would expect full text search functionality here. 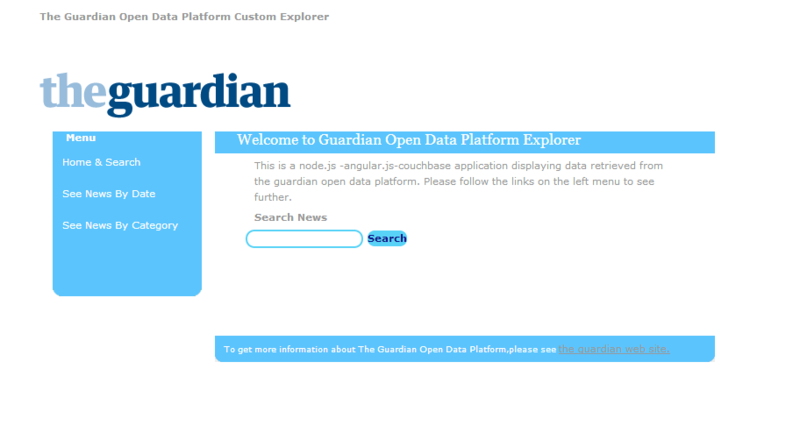 Basically,it is displaying data stored on couchbase using different views(queries if we speak in relational db terms).Data comes from The Guardian Open Data Platform via another app that i wrote.It is bringing various articles from Guardian website using the API that is served.By the way,i highly recommend anyone to have a look at The Guardian Open Data Platform. It is using express web application framework for server side operations.REST services are defined and connecting to and querying couchbase is implemented inside.Getting and querying data from a nosql db -including map-reduce functions- is showcased here. README files have clear instructions for installation. Next step is to do content base search using ElasticSearch. 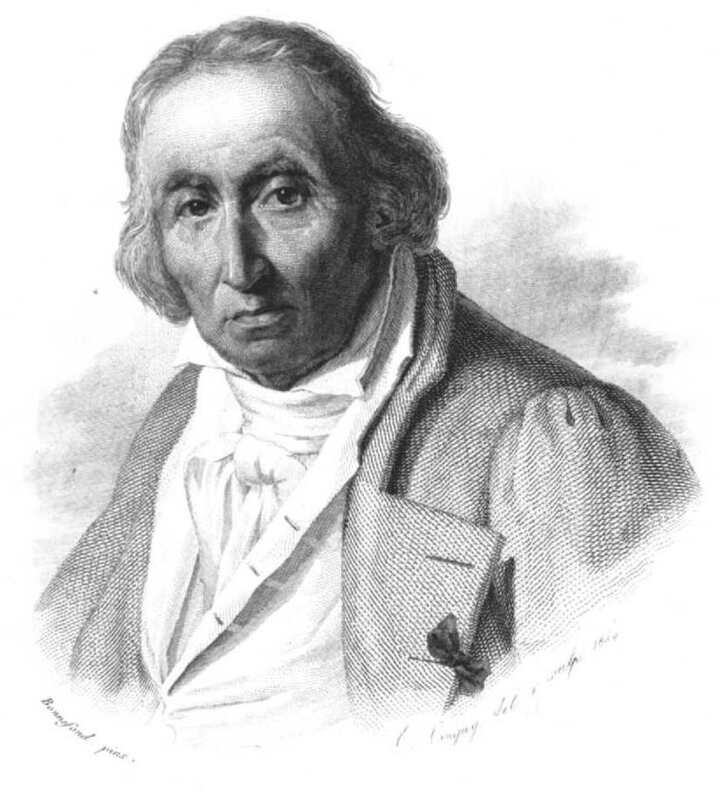 The guy who invented Jacquard Loom,which i think a very underrated invention founding basis of binary concept.This is when history of computing began! He was a french weaver on 19th century.To make weaving more efficient,he used punch cards(card having small wholes or not on its surface).A pin of the loom hits the card,if it is punched,it operates with its hook,otherwise it does nothing.So technically,he programmed the loom to produce the desired output. This was the start of the way up to the Mainframe,which resulted in IBM giving credit to him. Install version 2.7.3 here. Newer versions do not work. Download C client library from here.Extract it under C:/couchbase. lib folder should be placed right under this directory. We need this for C/C++ compiler.Anybody can find a better solution,be my guest.Since this was painful,i am writing down step-by step instructions. You need to install Visual Studio 2010.Not a newer version! If you have any Visual C++ 2010 copies on your machine,remove them. Uninstall any Visual Studio or SDK from your machine,including the ones installed by other programs. “error MSB8007: The Platform for project ‘couchbase_impl.vcxproj’ is invalid. Once you are done with this,run the install command again. To overcome this,install Microsoft Visual Studio 2010 Service Pack 1 from here. Sorry to expose so much Microsoft stuff to you. 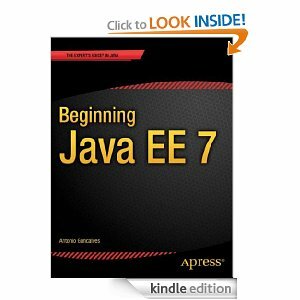 Recently i read “Beginning Java EE 7”, book from Java User Group Leader and Java Champion Antonio Goncalves. This book is a very neat introduction to JavaEE 7 getting into details in course of each chapter and putting everything together in a hands-on experience at the end.It is starting with an historical intro to JavaEE and then going through all components of it in a quite structured way. It is a quite thick book(500 pages) divided into 15 chapters.Each chapter picks an essential component of JavaEE and gets into details using a bottom-up approach.Starting with a general introduction to JavaEE7,book goes all the way through Context and Dependency Injection,Bean Validation,Java Persistence API and ORM in first 6 chapters.Next 3 chapters cover EJB’s in every sense includingTransactions,Callbacks,Security Services.Chapter 10 and Chapter 11 are about front-end:JSF and Navigation.The 12th chapter of the book is about XML and JSON processing and what JavaEE 7 brought in.Chapter 13 is named “messaging” and leaves no open questions about JMS and Message Driven Beans. As to the last two chapters;they are dedicated to Web Services (SOAP and REST). What i liked most about this book is the way it follows through each chapter. It starts with very simple and clear definition.Then it gives us some historical background of that component along with an overview of related Java Specification.Then we get introduced to what is new about that component in Java EE 7.And only after these steps we dig into broader details and start feeling the joy of coding.Personally i like this kind of well-planned and structured approach hence i enjoyed this book a lot.Moreover, it is a very contentful reference book. One improvement could be to compare JavaEE with the current frameworks in place (like Spring) in much more detail.Since open source frameworks on Enterprise Java are arguably prevalent in the industry,it would be nice to have to see differences and JavaEE’s advantages over them. All in all,i certainly recommend Antonio Goncalves’ book to all Java/JavaEE developers.It is definitely worth reading and if you are not into reading a few hundred pages,worth using as a reference book.